Well, can you believe my surprise when the Parcelforce man knocked at the door yesterday! 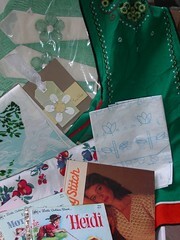 It was my Vintage Swap goodies from Joy in the States. She posted it on Oct 21 and it came on Jan 4! We thought it was well and truly lost in postland because when Christmas arrived and it hadn’t come, I wasn’t holding out anymore hope. What a lovely surprise. She included two tablecloths, some napkins, an apron, a large sheet of embroidery transfers, three Little Golden Books (Heidi, Mother Goose *and a counting book) and a copy of * Stitch by Stitch. Along with all the goodies, she sent me one of her lovely handmade cards. Thanks Joy! x Many thanks to Toni for organising the swap.